Usually when software gets installed onto your computer, it copies the needed files and registry entries onto the system for the program to function properly. And when you want to uninstall the software it should but doesn’t always remove everything that was added in the first place. Most of the time there is useless data left over which should have been removed because the uninstaller maybe is corrupted or even badly programmed. Depending on the program and how good the uninstaller is, this could range from one or two innocuous registry keys right up to hundreds of keys and several Megabytes of leftover files. One way to find out yourself what is getting added to your system during a software install is to actually check the state of your system before the installation, and then check again afterwards to see what has changed. 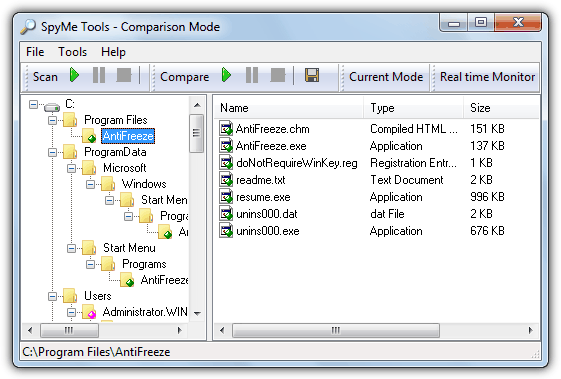 Here’s a selection of 7 tools that can track what file and registry changes are made during a software install by creating and then comparing before and after snapshots of your system, all were tested on Windows 7. 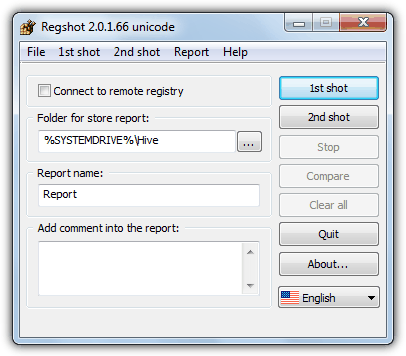 Regshot is a long running utility that can quickly take a before and after snapshot of the system registry. Also in the more recent unicode version it’s gained the ability to monitor for file changes using CRC32 and MD5 file checksums although this function is turned off by default and you have to go to File -> Options -> Common Options -> and tick “Check files in the specified folders” to enable it. Only the Windows folder is entered into the list of watched folders so you have to enter any others yourself through the Folders tab. This version also added the Connect to remote registry option. Regshot is very much a “hands on” utility and is more for experienced or advanced users to quickly check for system changes between two different points in time. Simply create the 1st shot, install the software or run the program you want to watch, and then press 2nd shot. After comparing the differences in the 1st and 2nd shots, it will open an HTML log in your browser listing all the detected changes. Being only a few hundred KB and portable, Regshot is an extremely valuable tool to have around. The original Regshot is still very slowly being developed and there is a recent beta with separate 32 / 64-bit and ANSI / Unicode versions that can be found at SourceForge. 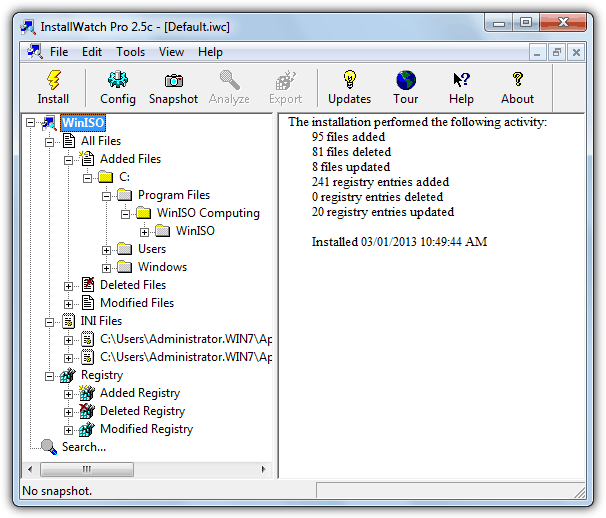 InstallWatch Pro is quite an old utility which works in a similar way to RegShot in that it tracks any changes made to your registry and files between 2 given points in time although this program is more specifically designed for tracking installs. The program is quite detailed in what it can track and includes additions, deletions, or modifications to files and directories, INI files and the system registry. The good thing about InstallWatch is the easy to read way in which the results are displayed because it behaves just like a standard Explorer window with an expanding tree view of the sections on the left. 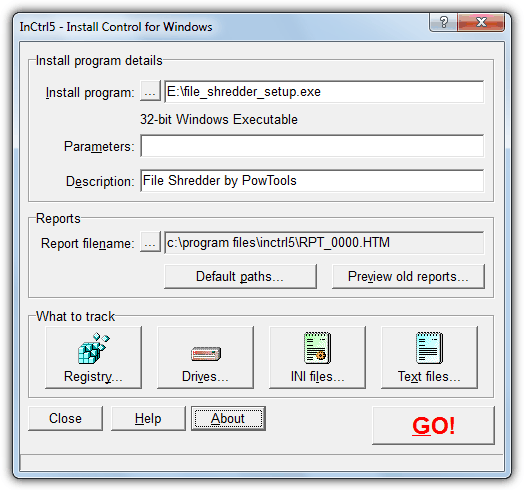 While the program is running it will detect if you run a setup installer and ask to create a before snapshot, or you can simply click the Snapshot button on the toolbar. After install, it will ask to create the after snapshot or you can use the Analyze button. The result can then be browsed or individual sections can be exported to text or HTML. All installs are instantly accessible from the tree view and there is also a useful search function. This utility has something the others in the list don’t which is a function to monitor a drive or folder in real time for file changes and could prove a useful addition when doing a bit of troubleshooting. SpyMe Tools is a quite an old program but is still perfectly capable at creating before and after snapshots to watch an install or software for changes. It does have one drawback though because there is only the facility to snapshot either files or registry, not both together, changeable in the Current Mode option on the toolbar. Like InstallWatch Pro the interface looks a lot like Explorer so you should feel at home navigating around. The way SpyMe Tools works is slightly awkward because you have to click the Scan button and save the snapshot, install or run the software to track, then click the Scan button again and save another snapshot with a different name. Both are then tested for changes using the Compare button and the results will show in the window. The differences between the 2 snapshots can be saved as a text file. SpyMe Tools is also a portable program. InCtrl5 is an incredibly old tool dating way back to the year 2000 but some users may have heard or used it before, and it can still do a job with a little bit of effort. There are one or two issues with it though which require a bit of knowledge to use the program effectively. First, unsurprisingly InCtrl5 will need to be run in compatibility mode for Windows Vista, 7 or 8. Using the program is pretty easy and it will track changes to the registry, drives and folders, ini files and also specific text files. Inclusions and exclusions can be configured by using the What to track buttons. After selecting the installer you want to track, it will create the before snapshot for you. Then you install the software and press the Install Complete button to create the after snapshot and the analysis, which could take a little while. The result will then open up a window where it can be viewed or saved as HTM, TXT or CSV files formats. The free System Explorer systemexplorer.net and has also a Snapshots tool to record and compare changes in files and/or registry. My favourites were always Advanced Registry Tracer [ART] & Advanced Registry Monitor [ARM]. They both have a “create redo reg” & “create undo reg” feature. From memory they [or only one of them] can detect file size increase/decrease/modified & file date changes too. Its been a while but Advanced Registry Tracer’ System requirements for ART states it can support current windows versions. Process Monitor works with x64 and 32 registry. It also can monitor both files and registry at the same time, plus much much more. It’s free, and you can get it from Microsoft. It replaced RegMon and FileMon tools. The only downside is that because it has so many extra capabilities, it’s not as user friendly as older registry tools. It does come with a great help file, and once you get the hang of it, you’ll never look at older registry tools the same. We’ve mentioned Process Monitor in other articles and its real time abilities. Sadly there’s far too much useless information and filtering needed for it to be used as a before and after snapshot comparison tool. Many thanks, this article helped me find something in the registry. I will add one more comprehensive tool named Lepide File server auditing tool which also provides the way to track every critical changes/access made on file server into real time. Many thanks for the article. I tried SpyMe Tools and it worked fantastically. Was able to easily collapse registry keys for changes that I could easily rule out, and it made it far easier to locate the keys I was looking for. The biggest issue was figuring out how to use the program. Pressing the scan button seems to scan, but doesn’t show any output so I couldn’t figure out what to do from there. Eventually I saved the scan results (even though none showed) and then ran another scan, again nothing showed, saved those results, and then ran a compare and browsed manually for the files. Aside from that the ui and functionality seems great, my new favourite. Any of those software would help me to keep track of changes after the software is installed? For example… 30 days trial software. If change os dates does not work to avoid end of trial period is because it’s storing something on the registry probably at every usage. I would like to see what was changed after the execution of a software. Any of thsese soiftware would help me? The version of Regshot listed in the article is old. X-Regshot 2.0 can output .reg DIFF files when taking into account 2 registry comparisons. The only trick is to change the default language from Russian to English, the flag button in the bottom right on first startup. Regshot 1.x leaves a lot to be desired unfortunately. It appears you have got confused somewhere, X-Regshot IS Regshot with a rather pointless WinPenPack splash screen tagged on. I think a few of them do what you ask, but RegShot is probably the easiest to use. After running the 2nd snapshot and comparing, look in the Report folder (usually C:\Hive) and find the RedoReg.txt file. That’s the difference file and you simply rename the extension to .reg and import into the registry later. What gives and who compiled that “Regshot 2” version in Russia? The Regshot Unicode version was a fork of the original Regshot after it was pretty much abandoned for something like 3 or 4 years. It’s been around since 2010 and many people prefer it for the extra functions and unicode support. Unfortunately the website for it is now gone. Both InstallWatch Pro and Systracer output the changes between before and after snapshots as reg files. Unfortunately the free version of InstallWatch Pro is limited in that a record of deleted registry keys and values is not available. The full version had this feature, but after much searching using Google I have not been able to locate it. I scanned InstallSpy 2 with VirusTotal.com and it’s showing a possible infection. Can anyone confirm? That’s definitely a false positive, the creator and host of the file, 2brightsparks.com, is a well respected software developer. 1 out of 46 at VirusTotal is classic false positive territory. Thank you so much. I recently performed a complete system restore, only re-installing 8 programs. Now, I have to temporarily install more programs. Hopefully, I will never have to restore my computer again with this. This is awesome info. Thanks alot I only knew about a few of these tools. Thank you very much for your useful post! Since I began to use Total Uninstall (1 year ago) I never had to reinstall Windows! This program really removes everything! Windows will be in top shape no mater how many apps you install/uninstall! This kind of application is excellent to keep bloatware and crapware under control. Thanks man, its great tutorial. I always wanted to keep my system clean and I am gonna use Total Uninstall. This is great. Thanks a lot. I used to know about FileMon and RegMon only. Total Uninstall is what I use, but thanks for rest of the softwares, great tips no doubt, cheers mate!